Travelmobs specializes in escorted group cruises and tours for the LGBT community and our friends and families. The luxury travel industry is revving up and ready to help celebrate the long awaited legal marriages of gays and lesbians from around the world. 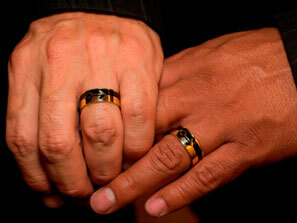 Slowly, very slowly, gay marriage is becoming acceptable and legal. The luxury travel industry knows where there is a marriage there is travel and what better way then to take a romantic cruise to celebrate. The cruise lines even now offer packages perfect for your honeymoon. Some packages include: breakfast in bed, Champagne, engraved flutes, flowers, bathrobes, chocolates, 8×10 silver frame for portrait, cocktail party hosted by the ship’s captain, and much more (ask your cruise specialist about the additional cost). Tables for two are also available but can be limited. Every cruise line has there own honeymoon packages and vary slightly. 5 – Princess Cruises – Star Princess 7-night Alaska: Romance the great state of Alaska. If you ask anyone who has cruised all over the world one of their top and favorite destinations is Alaska. The Land of the Midnight Sun, you can use every extra minute of daylight to get more than just a suntan. From the blue ice of a massive glacial field to the stunning grandeur of the scenery and wildlife, everything in Alaska is huge. Ketchikan, Juneau, Skagway, Alaska as well as Victoria, British Columbia are the ports o call on this weeklong cruise. It’s a great adventure with long days and intimate nights snuggling with the one you love. 3 – Celebrity Cruises – Celebrity Equinox 10-night Greek Islands & Mediterranean: A dream vacation on a dreamy ship. What better way to celebrate you nuptials then in the Greek Islands. This port intensive itinerary includes Sicily, Athens, Turkey, Rhodes, Santorini, Mykonos, and Naples. It’s the region of ‘mosts.’ The most romantic cities. The most fashion forward. The most delicious foods. So you both can spend time enjoying centuries-old treasures on land and return to luxurious accommodations onboard – perfect for every couple. 2 – Royal Caribbean – Oasis of the Seas 7-Night Caribbean Cruise: sail the warm waters of the Eastern Caribbean on the largest ship in the world. Soak in the sun as you visit the Bahamas, St. Thomas, and St. Maarten. Experience the ship that revolutionized cruising, its groundbreaking design introduced seven distinct neighborhoods built for ultimate enjoyment. Watch acrobats splash down in the AquaTheater, the first amphitheater at sea or stroll through central park (yes, an actually park with trees) it’s ideal honeymoon destination. 1 – Celebrity Cruises – Celebrity Millennium 14 –Night South East Asia: The Far East, a kaleidoscope of exotic sights, sounds, tastes and experiences. This is the honeymoon to end all honeymoons. Experience the 10,000 years of romance in Asia departing from Hong Kong, China with ports o call in Hanoi (Halong Bay), Vietnam; Hue/Danang(Chan May),Vietnam; Ho Chi Minh(Phu My), Vietnam; Bangkok/Laemchabang,Thailand; Singapore. It really is an experience many people do not have in their lifetime. Romance is what we all love and to experience travel with a spouse makes the life long journey one for the ages. If you proposed to your partner or celebrated a honeymoon on a cruise we would love to hear your romantic stories – reply below. Enter your email address to follow the mob and receive notifications of new posts by email. Pack your bags it time for Pride!